I find Google is my best friend on a Sunday afternoon it is a great way to discover products. 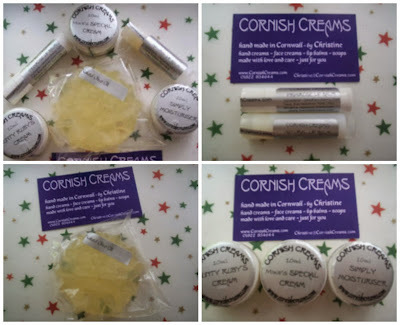 I recently came across Cornish Creams, handmade skin care from The Tamar Valley in Cornwall. Christine makes chemical free products which she sells via her website and local markets. I received samples of Aunty Ruby's Cream (ideal for mature skin), Mike's Special Cream (ideal for eczema & psoriasis), Simply Moisturiser, Natural Lip Balm, Primrose Lip Balm and Naked Olive Oil Soap. All her products have tested well but a couple really stood out for me. I have really enjoyed using the lip balm. There are three ingredients in the Natural lip balm Cornish Beeswax, Almond Oil and Coconut butter. I can not recall ever using a lip balm that does not contain a fragrance/flavour and it has made a pleasant change. The balm has a good consistency and texture, it is not sticky nor heavy on the lips. It absorbs and leaves my skin feeling soft. The simple (but effective) ingredients are why I like this product as it reduces the risk of allergens making it ideal for sensitive skin. The Primrose version differs only in terms of ingredients - Cornish Beeswax, Evening Primrose Oil, Shea Butter, Sea Buckthorn with a slight fragrance from Bergamot Essential Oil. There are other lip balm flavours available you can chose from Avocado, Blue Raspberry and Spearmint. It has been a number of years since I used a solid soap but I have enjoyed using the Naked Olive Oil soap. It has held together in the soap dish and not turned to mush. It lathers nicely and I have been very impressed because I have not experienced any dryness on my hands which is a common problem for me. The BF even gave his approval and said he liked using it. When you use a soap like this containing simple effective ingredients you soon question why other brands feel the need to pad out their products with chemicals. Cornish Cream soaps are environmentally friendly because they not made using palm oil. If you are on a budget you may be interested in Simply Moisturiser. Christine has created a "credit crunch" cream which does not have the added extras of her other creams but still contains effective ingredients (Coconut Butter, Almond Oil & Cornish Spring Water). It is suitable for face and body making it a good multi purpose product for those of us feeling the pinch. It is always nice to find someone who has a passion for what they do and this reflects in the quality of their products.